Protecting open land in the Willistown area is the Trust’s highest priority. Staff members utilize all available conservation tools, including donated conservation easements from private landowners, the purchase of conservation easements, the purchase of land, seeking and leveraging public funds to acquire land or easements, and accepting donations of land. In addition, the Trust has developed an array of creative and proactive approaches to land protection. With our critical mass of protected open spaces, we have a tremendous opportunity to improve habitat for wildlife. Whether on one of our nature preserves or on private property, practicing and promoting careful management of land, or land stewardship, is an important part of our conservation work. The Trust’s Bird Conservation Program works to enhance and promote bird conservation in the Willistown area and beyond. 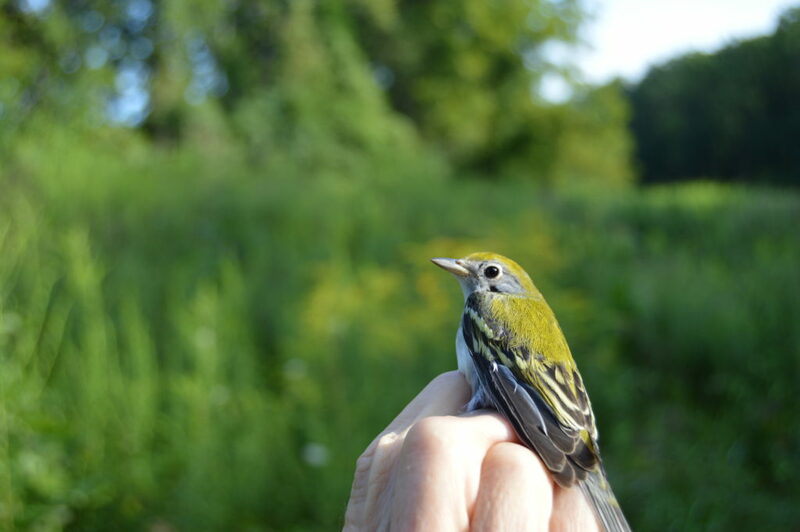 Our primary initiatives include bird banding, bird tracking via Motus, bird monitoring, and habitat restoration. Our bird conservation program is nationally recognized, and attracts students, scholars, and scientists from all over the country. Trust staff members view our protected lands (and those not yet protected) as a large reservoir of natural resources and strive to work with area landowners to manage this land for the promotion of healthy ecosystems and the diversity of flora and fauna. The Trust aims to strengthen its reputation among private and public landowners as an excellent resource for advice on how to help sustain plants and animals that were once common in this area. Our Land Stewardship efforts focuses on habitat restoration in our nature preserves and develops and promotes guidelines for private landowners. Native tree, shrub, and wildflower plantings are the most common habitat restoration projects. Our goal is to enhance bird and wildlife habitat and to protect water resources. The Community Farm program models and promotes sustainable agriculture, producing healthy food for the community while enhancing the area with biodiversity and habitat. Rushton Farm, uniquely situated within the 86-acre Rushton Woods Preserve, is the centerpiece of the program, hosting a 130 family CSA, myriad school groups, volunteer days, and a “Share the Bounty” program that donates thousands of pounds of fresh food to local food cupboards. The Trust is working to develop a system that will provide an in-depth look into the function of the Ridley, Crum, and Darby Creek watersheds by establishing several long-term water quality monitoring sites with specialized, permanently installed, testing equipment. In collaboration with scientists from the Academy of Natural Sciences at Drexel University and other institutions with expertise in watershed protection, the Trust’s Watershed Conservation program seeks to develop and implement best practices for enhancing water quality, and to share its findings with other land trusts throughout the region and the country. In addition to on-the-ground land protection, stewardship and farm efforts, Trust staff members spend an increasing amount of time on education and public outreach. Through publications, events, educational activities and habitat restoration projects, the Trust aims to raise awareness about the benefits of land protection and stewardship, thus forwarding the Trust’s mission.